Congratulations to Woo Skincare + Cosmetics on being named by Atlanta Magazine as a Top 50 Shop in Atlanta in the beauty category. Magazine staff explored the metro area for the best places to buy clothes, jewelry, and cosmetics for men, women, and kids. “Shops,” were defined as an intimate space that feels like a one-of-a-kind experience. In their honor, we pulled the beauty feature from our Ode to Lipstick blog, describing the boutique retailer. Pop in today to see how you can be wooed by Woo. In winter 2014, Regency featured Woo Skincare + Cosmetics, a boutique with top-of-the-line cosmetics, skincare, fragrances and gifts. The company started in Nashville, TN in 1992 and was founded by Woo Caroland. Woo’s eye for artful merchandising and a talent for recognizing emerging trends in beauty have made the original Woo Skincare + Cosmetics an overwhelming success. 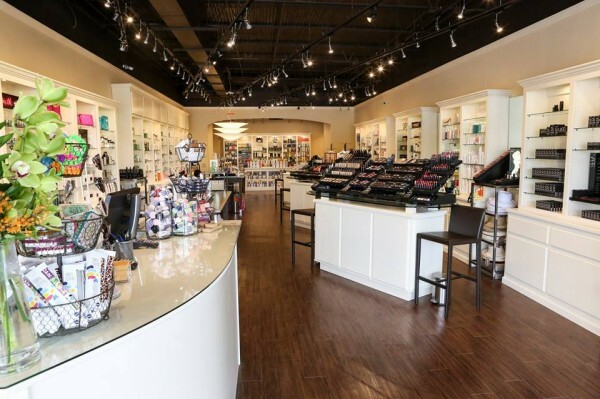 The beauty store opened their fourth location in April 2015 at Regency’s Paces Ferry Plaza, situated in the wealthiest zip code in Metro Atlanta and the second wealthiest in Georgia. The store occupies 4,000 SF of retail space and includes spa amenities. They offer a wide range of products — from recognized brands to niche lines and cult favorites, including a sizable assortment of lipstick. “Lipstick is a timeless luxury and go-to beauty item that makes a strong statement for a minimal investment,” says Woo Skincare + Cosmetics beauty consultant, Aria. The company was founded to give women a personal, pampering and fun shopping environment for their makeup and skincare choices. “As each client is very different, so are our artists and estheticians. When given the opportunity, we try to marry the client to the artist or esthetician who would best complement their personalities, as well as their needs,” says Linda Silber, co-owner, Woo Skincare + Cosmetics Atlanta. With local ownership and in-store expertise, every experience at Woo is characterized by the “golden rule” that every customer leaves happy. “At Woo, we don’t ‘sell.’ If a customer wants to buy something, great, or just look around, that’s great too. We try to determine what the client is interested in and show them the benefits of the products best suited for those needs. We are also big advocates of sampling. We would rather have a client try before they buy to make sure they like it. Further, if a customer doesn’t love that particular brand, we have many other options for them to try,”continues Silber. To stay current, the beauty store is continuously adding collections and energizing the classics, always offering something new for customers to try. All Woo artists are educated on each and every brand, providing the customer many options along with a personalized experience.